Eden Kazoleas and Jessica Drolet are returning with their lawyer, who negotiated their release. In this photo dated Jan. 27, 2018, issued by Cambodian National Police, a group of foreigners stand after they were arrested for "dancing pornographically" at a party in Siem Reap town, near the country's famed Angkor Wat temple complex. 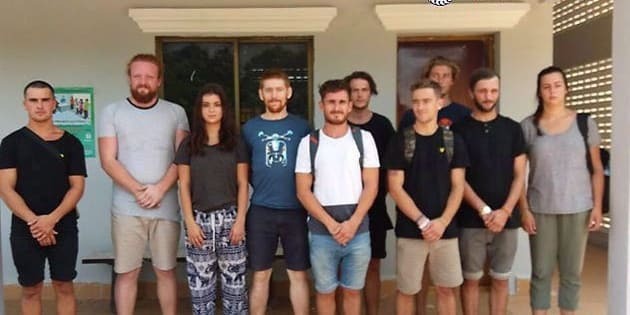 TORONTO — Two Canadians are among seven Westerners released on bail today by a Cambodian court after they were arrested for allegedly posting photos on social media showing them engaged in sexually suggestive dancing. A news release issued this morning by Upstream Strategy Group said 19-year-old Eden Kazoleas and 26-year-old Jessica Drolet were returning to Canada with Toronto lawyer Frances Tibollo, who negotiated their release. The statement said they are due to arrive at Toronto's Pearson International Airport at about 6 p.m. ET and that a news conference be held. Yim Srang, a court spokesman in the northwestern province of Siem Reap, said the investigation has been completed and the seven were freed Wednesday, but no trial date has been set. He said three other people remained in detention but he didn't know their names or nationalities. The 10 people arrested — including five from the United Kingdom, and one each from Norway, the Netherlands and New Zealand — were detained when police raided a commercially organized party at a rented villa in Siem Reap town and found people dancing at an event described as a pub crawl. Siem Reap is near the famous Angkor Wat temple complex. Police said those caught in the raid had been "dancing pornographically" and offended Cambodian standards of morality. They face up to a year in jail if convicted.